There’s no denying that photo uploads are a huge part of people’s internet activities. 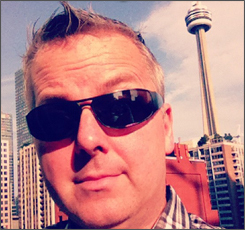 Each day an average of 40 million photos are uploaded to Instagram alone. 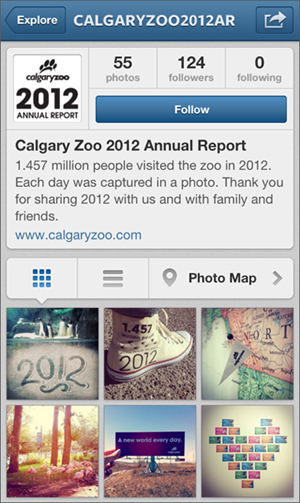 Tasked with creating the 2012 annual report for the Calgary Zoo, Trigger Communications made note of the large number of images that zoo visitors had uploaded with the hashtag #calgaryzoo. If their audience was using Instagram to express their relationship with the zoo, why shouldn’t they. With client approval the team set out to create and deliver the 2012 annual report in Instagram. The execution fit well with a limited budget and the conservation values of the zoo. Original photos were shot with iPhones, and copy was reworked for readability within Instagram’s caption and comments format. Copies of the financial statements, which are presented as photos as well, are available in a more reader-friendly version by request. This isn’t the first time that Trigger has come up with a creative solution for a Calgary Zoo annual report. The 2011 annual report was published as a one-page foldout printed on recycled newsprint.